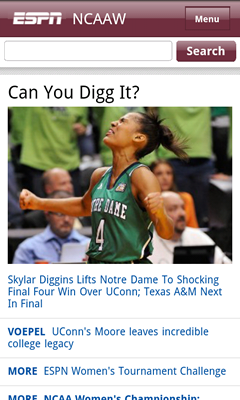 Normally I rely on the mobile edition of Yahoo Sports but recently realized they are completely missing any coverage of NCAA Women’s Basketball, specifically the Final Four tournament now in progress. Fortunately, ESPN mobile is giving the women equal billing with a dedicated section just for the NCAA Women’s Tournament. Our house was very sad when the Stanford women were beat yesterday, but at least Notre Dame beat Connecticut so now we can root for the Irish tomorrow night! I know we can and will reach an agreement. My goal as Commissioner now is to help our teams and players find a solution that is fair to everyone and ensures that football becomes more popular, accessible, and fun. We want the next decade to be the best yet for our fans, and I’m ready to work day and night to make that happen. We’ve come a long way. Compare where we are today with 10 years ago. From player accountability to player safety, more and better television coverage, upgrading the in-stadium experience, innovations like the RedZone channel, the Draft in prime time and playing the Pro Bowl before the Super Bowl, we are focused on doing what’s best for the players, teams, and fans. My priority is and always will be the game and the fans who love our game. The NFL is great because fans care deeply about it. Economic conditions, however, have changed dramatically inside and outside the NFL since 2006 when we negotiated the last CBA. A 10 percent unemployment rate hurts us all. Fans have limited budgets and rightly want the most for their money. I get it. Yes, NFL players deserve to be paid well. Unfortunately, economic realities are forcing everyone to make tough choices and the NFL is no different. These are not easy negotiations, but the outcome can be positive. If both sides give a little, everyone, including fans, will get a lot and the game will improve through innovation. Even in difficult economic times, a new CBA presents us with the opportunity to secure the future of our game. You may ask how will the NFL look under this vision? A significant change would be to resolve fan complaints about preseason by modifying our 20-game format. Fans tell us they don’t like the quality of the preseason games, and we’re listening. An enhanced season of 18 regular season and two preseason games would not add a single game for the players collectively, but would give fans more meaningful, high-quality football. in the way they train in-season and off-season. contracted $1.2 billion to 256 drafted rookies with $585 million guaranteed before they had stepped on an NFL field. Don’t get me wrong: top draft choices will continue to be highly paid. All we’re asking for is a return to common sense in paying our rookies. Other leagues have done this and we can too. These improvements and more will lead to better football, plain and simple. A forward looking CBA that is fair to players and clubs will lead to a great future for the NFL and our fans. My job is to represent the game — the fans, teams, players, coaches and business partners. Protecting the integrity of the game and ensuring it thrives is a responsibility I take very seriously. This is about more than a labor agreement. It’s about the future of the NFL. We have to improve and will be relentless in our quest. The commitment to our fans is to make the NFL experience even better in the years ahead. With a responsible CBA, we will fulfill that vision. Happy New Year and enjoy the playoffs. 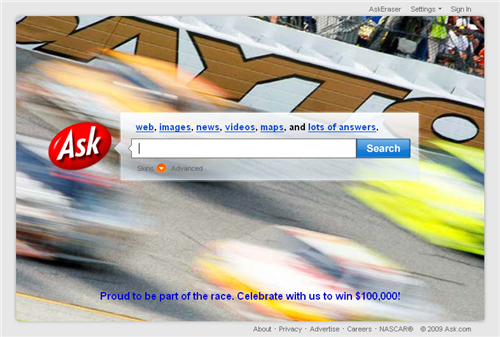 Ask.com, a leading search engine and an operating business of IAC, announced Wednesday it has entered into partnerships with NASCAR, NASCAR.COM and Hall of Fame Racing. Under the terms of the partnership with NASCAR, Ask becomes the Official Search Engine of NASCAR, with category exclusivity and a broad set of promotional rights in order to reach the sport’s estimated 75 million loyal fans. In addition to the on-screen advertising, Ask.com is sponsoring Bobby Labonte in the 96 car (for 18 of the first 21 races), has created a NASCAR toolbar, and has created a new NASCAR homepage. I think the idea of an “official search engine” is pretty solid, even if it sounds a bit hokey. This move won’t put Google out of business, but Ask should pick up some incremental search traffic from NASCAR fans during the year. For an idea of how valuable this kind of exposure can be, see my previous article on NASCAR sponsorship exposure value. I wish Yahoo! had taken this opportunity a couple years ago when we were involved in NASCAR (Yahoo! sponsored Tina Gordon in her Busch series car). Unfortunately, I don’t think the value was there for Yahoo!, especially considering that Gordon didn’t qualify for many races and didn’t spend much time running up front.